The Custard TV: REVIEW: Luther back to its haunting best. REVIEW: Luther back to its haunting best. It's the long-awaited return of the lawfully bent but morally straight copper. The introduction to series five proves age has not dimmed him as he chases a scally in the night amid beautifully constructed shots. Naturally, he gets his man but this man isn't important because it's in the kidnapping of John Luther where things start proper. 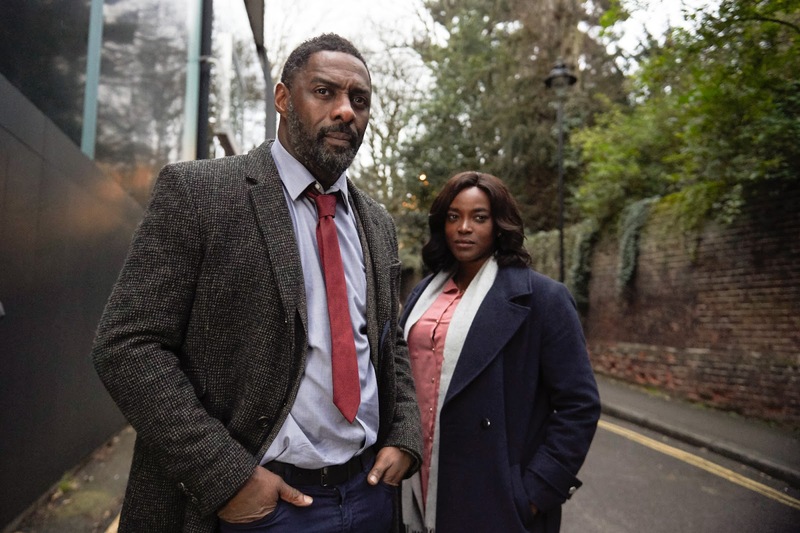 As a programme Luther has a well-established feel for each episode - there are always two narrative strands- the case itself and the more personal story for our main man to manipulate his way out of. That familiar route is followed again here. We see glimpses of a bloody murder in a tense street scene and away from that Luthe, once the bag is removed from his head, is reintroduced to an old foe in George Cornelius - a man so London he might as well be called Big Ben. George is searching for his missing son and thinks Luther may have stolen him due to their radiator related past. It's a bit of a stretch but we'll go with it because it's a welcome return for the pantomime villain's smug sneering. It's a wonderfully atmospheric and fast-paced opening which is a relief after the sluggishness of series four. The murderer is James Hauser (Jami Reid-Quarrell) whose fetish is to turn humans into his own voodoo dolls. 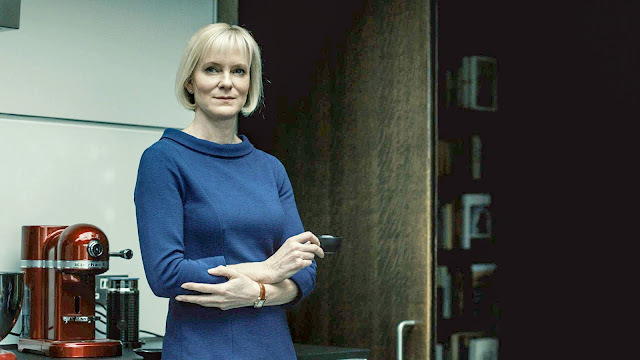 At first, Vivien Lake (Hermione Norris) comes across as a mum trying to cover up his gruesome crimes but she's actually his psychiatrist and there are strong hints of a severely unhealthy doctor/patient relationship. What follows could be most chilling and stressful scenes the show has ever committed to screen, the attack on the bus, in particular, is frightening in its horrific creepiness. The aesthetic of the show is more glaring than ever before, the colours are brighter and the gloom is bleaker. All in all, it's an engrossing palette for the senses. Luther's interest in George gets him into trouble and a plant almost blown up. He gets away with it this time but George is literally gunning for revenge. And some apples and pairs, probably. The team track Howser down to common by following Vivien but just because he slits his own throat and dies it doesn't mean his story is over. While his body lies in the morgue.. he also lies (very much alive) in the boot of his doctor's car. It's a twist that recalls Steven Robertson's identical twin reveal in series two and it's a compliment that even when retreading old ground Luther's footprints are always fresh. As a sense of calm washes over John in his sleep, the three horsemen of the apocalypse look to be heading for his front door - his work colleagues, an angry George and somebody called Alice who isn't dead after all. It's just a shame we knew this because of the spoilers in the promotional campaign. It's a true water cooler dampened. Thankfully, the return of Luther was no damp squib. - We meet Luther's new assistant Halliday (Wunmi Mosaku) and the relationship is frosty, to say the least. Don't worry though, it won't be long before they get close and she has to die because of it. - Alice is back from the undead and as ever we have to ask what her motives are, just how she will help Luther and how much she will hinder him. - The reintroductions of George and Alice is surely no coincidence what with their connection to Jewels. Luther Continues Tomorrow, Thursday and Friday at 9.00pm on BBC One.